I have read your very informative pages and would like to ask you a few questions about blue and white Chinese export porcelain. Enclosed are photos of the front and part of the back of a charger. I have the following questions regarding this charger and the so called Nanking period. The charger measures 35.5 cm in diameter, 4 cm high, thinly potted and in general of a very good quality. It was sold to me in London by a dealer having all the signs of a reputable dealer. The item was said to be a late (about 1720) Kangxi export porcelain charger. In a price guide list I have seen a 35 cm plate with a close to identical pattern described as a "Nanking plate produced about 1760". 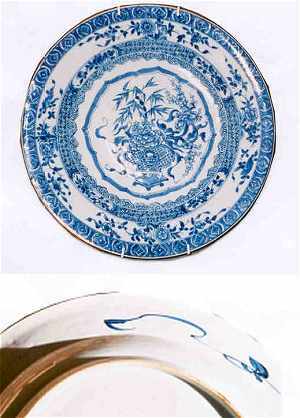 Here Nanking type of porcelain is linked to typical patterns and forms found on the Dutch ship that sank in 1750 (the Nanking Cargo of 1750). 1. Is it possible that that the charger could have been made in late Kangxi period, i.e. about 1720, or is it a typical 1760 product ? 2. Is this pattern a typical Nanking pattern, similar to one or several found on the Dutch ship that went down in 1750 ? 3. Is there a general agreement about when the Nanking period started, and is this only based on a simplification of patterns and change of forms? Dear Sir, first of all, your charger is of a very high and rarely seen quality. I have thought a bit about how to date it and a safe interval would be to say between 1720 to 1740 but somehow I don't think we have to settle for that. The quality of the paste and painting seems to account for the earlier date as do the beautiful branch painted under the rim but, the overall busy decoration with the - if you count them - five different borders belongs to a later tradition. The rim "twigs" occurs at least up until the 1740s so I think that your carger should be dated to the 1730s or more specifically, to the Yongzheng (1723 -1735) period. There is no way this charger could have been made in the 1760s even if some of the decorations occurs on mid- to late Qianlong (1736 -1795) export plates, especially the central panel and most of the borders. The main difference between your charger and later copies is a matter of quality and might be hard to judge from a picture. I would not say that this pattern is typical for anything but the multi border style of the Yongzheng (1723 -1735) period. Regarding the "Nanking" porcelain this is really mostly a trade name for "blue and white Chinese export porcelain" since a lot of this came to be exported from this harbour, so I would advice against using that name since it does not really mean anything. You might be able to find more information about this in my section on Chinese Export porcelain standard patterns.